Welcome to the Fit Small Business Xero training course! In this lesson, we’re going to cover how to set up customers in Xero. If you’re converting from another accounting software to Xero, then you know how much time you can save by having access to your customer contact details like contact person, email address and telephone number all in one place. Beyond contact details, you can setup custom payment terms (i.e. Net 30) and special sales tax rates if your default settings do not apply to a specific customer. 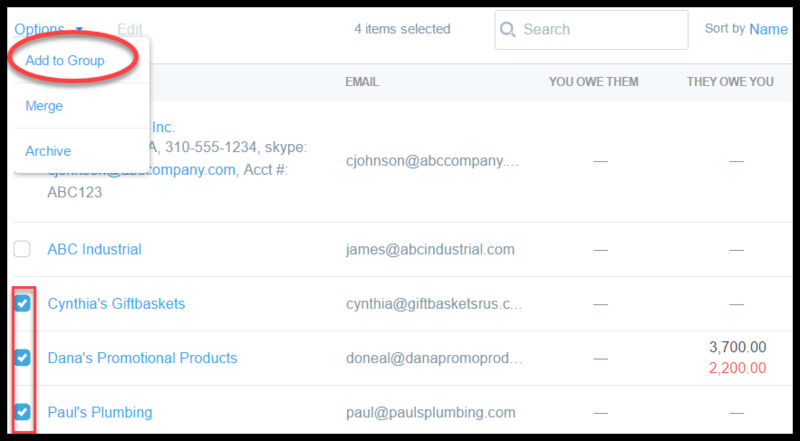 Xero also has a couple of great sorting tools called “smart lists and “groups” which can help you save time when invoicing customers or setting up email marketing campaigns. We will chat more about both of these later on. In this lesson, we will focus on how to set up customer contacts manually. However, if you have an existing customer list that you would like to import into Xero then check out our How to Import Customers lesson. Once you have imported your customer list, you can come back to this lesson to learn how to modify your customer information. In Xero, anyone who pays you money is considered a “customer” contact. Anyone you pay money to is considered a “supplier.” Based on the type of transaction (i.e. invoice, bill, credit note), Xero will automatically group your contacts as customers, suppliers or both. For example, if you purchase products or services and sell products and services to the same company, they will be set up as both a supplier and a customer contact in Xero. Although customers and suppliers are added under the same menu, there are different fields you need to focus on for each. If you want to add suppliers, we cover that here. To add a customer contact, follow the steps below. Step 1 – Navigate to the Contacts menu and select Customers as indicated in the screenshot below. This screen is broken up into 2 parts: contact information and financial information. We will cover contact info first. 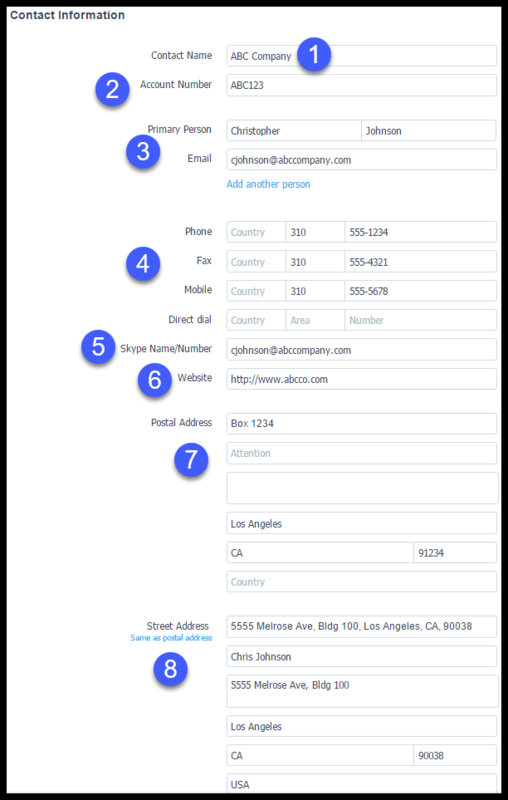 In the screenshot below, we have highlighted the key contact info fields to complete for your customers along with a brief description of each. Xero Contact Information – Enter contact details for customers in this screen. 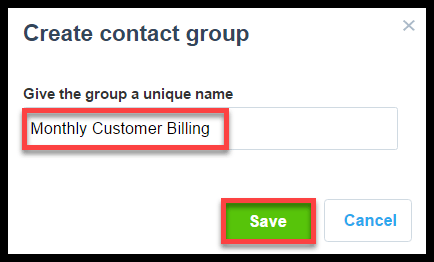 Contact Name – Enter your customer’s name in this field. Account Number – If you assign a unique number to each customer to identify them, enter that information in this field. This number can be alphanumeric. Primary person – Enter the name and email address of your primary contact in this field. If you have more than one contact, click the “Add another person” link directly below this field to add additional contacts. Phone/Fax/Mobile – Enter the telephone number, fax number and cellphone numbers for your customer in these fields. Skype Name/Number – Enter the skype id of your customer. This is ideal to have if you plan to communicate with your customer via Skype. Website – Enter the customer’s website info in this field, if applicable. Postal Address – Enter the mailing address where the customer would like to receive their invoices and other correspondence from you. Street Address – Enter the physical address of where the customer is located. This information is important when it comes to calculating sales tax. In the How to Set Up Sales Tax lesson,we discuss how to properly set up sales tax. Note: While it might seem time consuming to enter this information now, it’s important to set aside the time to do this because this data will be used for email templates, reports, any apps that you add-on from the marketplace and a variety of other tasks. In Xero, the setup screen for customers and suppliers is identical. For the purposes of this lesson, we will only focus on the fields that would relate to customers only. The fields that are related to suppliers will be discussed in the next lesson, How to Set Up Suppliers. In the screenshot below, we have highlighted the financial details fields to complete for your customers along with a brief description of each. Note: Any information that you enter here will be default settings for your customer. However, you can override them if needed when you create invoices, quotes, or credit notes for your customers. 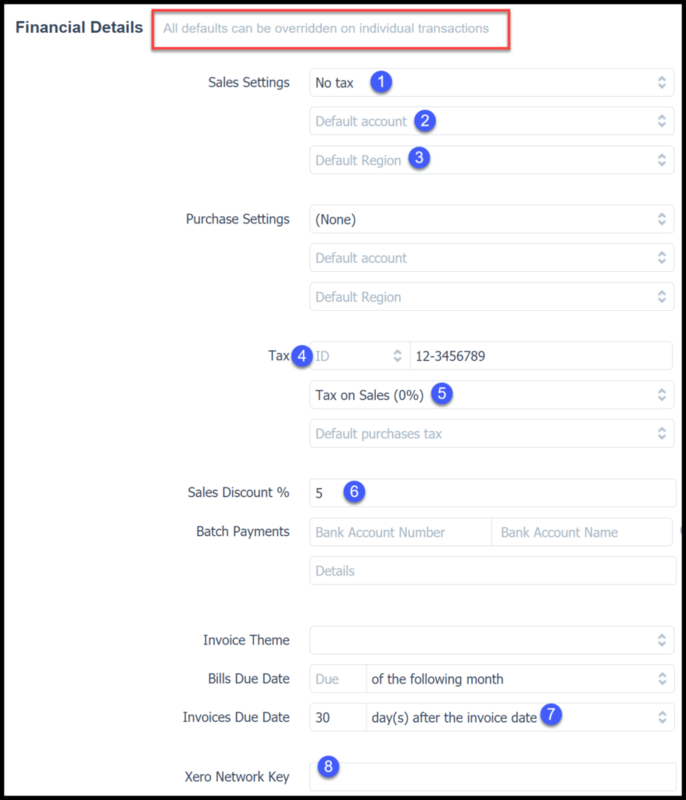 Default account – From the dropdown menu, you can assign a default account that will be used on all sales transactions that you create for this customer (i.e. invoices, credit notes). I recommend that you leave this field blank unless the product or service that you sell to the customer is always the same. Tax – Generally, you would need to keep your supplier’s tax id number (and not your customer’s) on file for 1099 reporting. However, if for some reason you do need to keep your customer’s EIN or social security number on file, you can enter that information in this field. Otherwise, you can leave it blank. Tax on Sales – From the dropdown, select the appropriate tax rate for the customer. If you have not set up sales tax rates, head over to the How to Set Up Sales Tax lesson to learn how to track and manage sales tax. If sales tax is not applicable, select the default rate (Tax on Sales 0%). Sales Discount % – If a customer should receive a discount on everything that they buy, you can enter the discount in this field to ensure that it is applied to every transaction created for the customer. Xero Network Key (Known as Xero to Xero) – This is a unique and private network key that is assigned to each organization. By entering the Xero network key for a customer, you will be able to send (and receive) invoices and bills directly into your Xero account. You can find step by step instructions on how to send a Xero Network invite to another Xero user here. Once you have added a new customer contact, you can make changes to the contact and financial information at anytime. Follow these steps to edit an existing customer contact. From the contacts menu, select all contacts and the following screen will display. In this screen, you can see the contact details of the customer in the first two columns. The last two columns will show your current accounts payable balance (you owe them) and your current accounts receivable balance (they owe you). Xero All Contacts Dashboard – This is a list of customers and suppliers along with the current A/P and A/R balances in this screen. From the customer list, click on the customer that you want to make changes to as indicated in the screenshot below. Xero Customer Contact Edit – Make any changes to contact and financial info for a customer. Once you set up a contact in Xero, you cannot delete it. However, you can archive a customer that you no longer plan to do business with. When you archive a customer, you will still be able to view the customer and any transactions that have been created; however, you will not be able to create any new transactions for that customer. The good news is that if you decided to resume business with the customer, you can easily restore the customer contact so that it can be used again. Let’s walk through the steps to archive a customer contact and then we will also show you how to restore a customer contact that was previously archived. Follow the steps below to archive a customer contact. From the customer list, put a checkmark in the box to the left of the customer that you want to archive as indicated in the screenshot below. Xero Archive a Customer – archive customers who you no longer do business with. Step 3 – Confirm that you want to archive the customer contact. As indicated in the screenshot below, click on the Archive button to proceed or click cancel if you have changed your mind. Follow the steps below to restore a customer contact that was previously archived. From the contact list menu, you will see a group entitled Archived as indicated in the screenshot below. Click on that group to display the contacts that have been archived. From the customer list, click on the customer that you want to restore as indicated in the screenshot below. 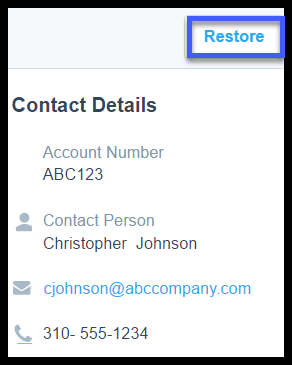 Xero Restore Customer – restore a customer who was previously archived. The following screen will appear. You can click restore to proceed or cancel if you have decided not to restore the customer contact. Let’s take a look at how smart lists and groups can help you get the most out of your customer contact info. A smart list is created by selecting criteria to filter your contacts and automatically add to a list. 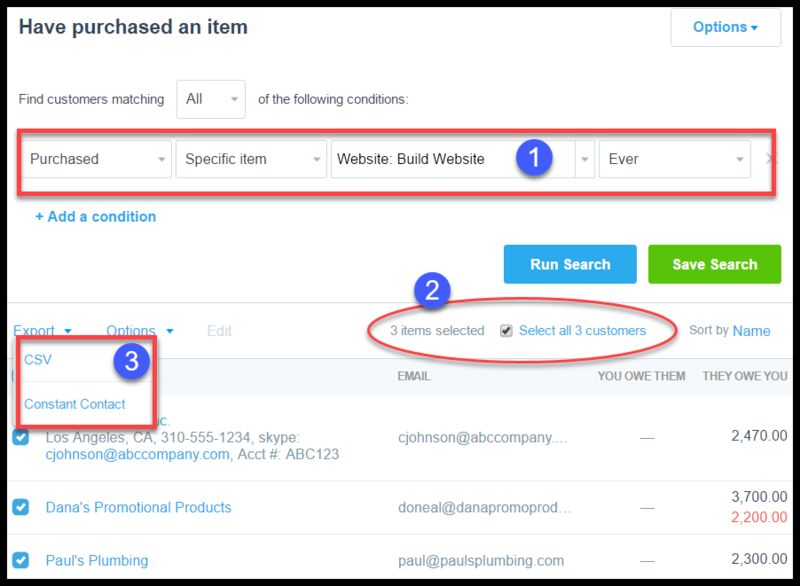 For example, you can create a filter based on inventory items purchased, outstanding customer invoices or geographical location of your customer. Here are the searches that are already set up in Xero; or you can create your own. Customers who have bought an inventory item. Customers who have had invoices outstanding for more than 30 days. Customers who have had invoices overdue for more than 7 days. Customers who have paid you in the last year. Example: Let’s say our fictitious company, Acme Web Pros Plus would like to know which customers they have had an initial consultation with in the last 30 days. They can run the customers who have bought an inventory item search and select initial design consultation as the inventory item. These search results can be exported to your email marketing program to send specialized promotional emails. Xero allows you to export contacts directly to Constant Contact or another email marketing program using a .csv file. To access Smart Lists, follow the steps below. Step 1 – Navigate to Contacts. From the Contacts menu, select Customers as indicated in the screenshot below. On the left-hand side of the contacts list, you will see Smart Lists as indicated in the screenshot below. You can select one of the four searches we discussed earlier or click the New link to create your own. Xero Smart Lists Menu – Create smart lists for email marketing campaigns and customer follow-up. In the screenshot below, we have run the “have purchased an item” search. You will find a brief description of each section below. Search Criteria – To continue with our previous example, in this section we have set our conditions for this search to all customers that have purchased a website. Since we have set up website as an inventory item, we are able to track our website sales in Xero. In our setting up products and services lesson, we discuss the importance of setting up inventory items and we show you how to do it. Search results – A total of 3 customers have purchased a website from Acme Pros Plus. Export options – As discussed, you can export these results to a CSV file or directly to Constant Contact. While Constant Contact is a pre-installed integration, you can also check out the Xero App Marketplace, which offers 500 additional integrations with a wide range of business software. While SmartLists are used to create targeted customer lists that you can export out of Xero, Groups offer a way to organize both customer and supplier contacts within Xero. For example, you can create a group for customers who are on a monthly billing cycle. If these customers are also billed the same amount then you could also create an invoice for each contact in a group. On the left-hand side of the contacts list, you will see Groups as indicated in the screenshot below. You can create a new group by clicking on the New link. Xero Groups Menu – create a group for customers who have something in common. Enter the name of the group and then click the “Save” button as indicated in the screenshot below. 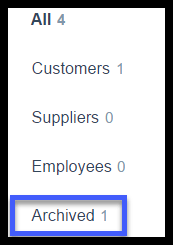 In the customer contact screen, put a checkmark in the box to the left of each customer that you want to add to the new group; click the dropdown next to options and select Add to Group as indicated in the screenshot below. That wraps up the section on how to set up customers. The next lesson in our Xero Training Course will be how to set up suppliers. In this lesson, we will walk you through how to set up contact and payment information for suppliers. To access this lesson or any of the others in the series, click here. For a free 30-day trial of Xero, click the button below.